Sometimes, to be inspired, you need to have an inspiration. Be it to achieve things, or to even think of what you want to achieve. I remember, a few years ago, I wanted to be a tennis player for India. I used to follow all of Roger Federer’s matches, even collected pictures, wallpapers, stats and what not. I’m digressing here. Sorry. I mean to say that when you’re having a dream, you would also, most likely have an idol. 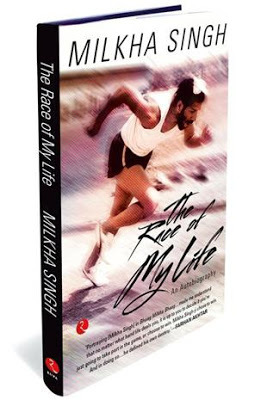 So perhaps, for a sprinter, to be Milkha Singh might have been one dream. I’ve not yet seen the movie, so to read the story first was quite refreshing. Right from the time before partition, to him fleeing for his life (puts the title into perspective), the book was a very honest read. I wouldn’t criticize the story, because only he could write his life like it is. It isn’t some fiction to say it needed something, and it should have had this. It is an autobiography, and this particular one, is inspiring. It is the story of an idol, of an Indian great, and a story of courage, determination, belief and excellence. I’m honored to have read it, and I would read it again soon. This was reviewed for Rupa Publishers, who I thank for the review copy. No other payment was taken for this review.